DUBUQUE —A flurry of Knights of Columbus from Iowa, Illinois and Wisconsin marched out from behind the closed doors of a large room in Dubuque’s Grand River Center on the first day of this year’s Iowa State Convention following the largest Fourth Degree exemplification ceremony to be held in Iowa in decades. More than 120 new members of this degree filled a large hallway in tuxedos with sashes across their chests. 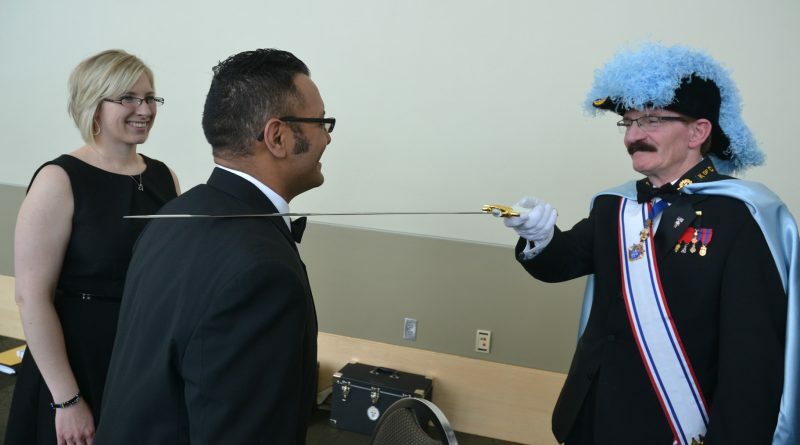 Interspersed with the new class were officers of the Knights carrying swords and dressed in the colorful feathered hats and capes that distinguish the regalia of this degree. They came out of the private ceremonies to line up for a photo on two large escalators and a stairway after being immersed for several hours in a private ceremony on patriotism, the virtue on which the Fourth Degree is focused. During the ceremony, they learned about Father Aloysious Schmitt, an honoree member of their class, famous as the first chaplain to die in World War II while saving others in the Pearl Harbor attack. His remains were recently indentified and brought home to Iowa. They also heard about other Catholic men who contributed to the country. “It was uplifting to see Catholic men there taking pride in their faith and serving their country,” said Rolando Morales of Monticello, one of the newly initiated. The degree promotes a desire to serve others and the nation, a call to action that resonated with Marty Kelchen, a new Fourth Degree member from Solon, in the Diocese of Davenport. “I was inspired by the sacrifices they highlighted that Catholic men made for the country,” he said. The convention, held annually, featured a chance for fellowship, business meetings and officer elections, activities for families, and seminars on how to build up the “domestic church” — a focus of the organization in recent years. Historically, the city of Dubuque is significant for the Knights of Columbus since it is home to Council 510. Established in 1890, this branch is the oldest Knights Council in Iowa and has been headquartered at its home on Locust Street for about 100 years. The Knights of Columbus, now the largest Catholic organization of its kind in the world, was founded in 1892 by Father Michael J. McGivney in Connecticut. It began with the mission to provide benefits, such as life insurance, to Catholic working class and immigrant families at a time when it was difficult for them to obtain them. The organization has since expanded its mission to include many other charitable efforts and now has about 1.9 million members worldwide. Each of its four degrees focuses on one of four virtues: charity, unity, fraternity and patriotism. There are over 30,000 Knights in Iowa, with much of their top leadership attending the convention each year. Mike DeMoully, convention co-chair, gave credit to the location and the emphasis on family for the large turn out. 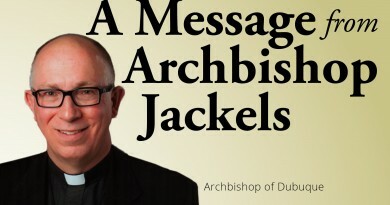 During his speech at the Friday banquet, Archbishop Jackels emphasized the value of striving for heroic sacrifice. “I don’t know of anything that’s more powerful than (those) — whether it’s a priest in a parish or parishioners in a parish, people at home or at their work — who have made the decision to follow Jesus and so have taken up their cross and have lost their life for the glory of God and for the benefit of others,” said the archbishop. Masses were held all three mornings of the convention, with seminars meetings during the day for Knights while their wives and children completed other activities. On April 9, Antonio Banuelos, also of Des Moines, was elected the new state deputy, and will start serving in July. Banuelos is among a growing number of Catholic Hispanics in Iowa, and hopes, as state deputy to reach out to new immigrants and integrate them into the organization. Another priority for Banuelos and the Knights is to help men become good leaders in their families and in the church. This message hit home with RJ Kunze, 20, the second youngest man to enter the Fourth Degree on April 7. Young or old, the desire to serve motivated many to engage in the charity events the Knights organize — such as supporting crisis pregnancy centers and the Special Olympics. Brandon and Tamera Haley of the Des Moines Diocese brought their children to the convention to help foster their faith.